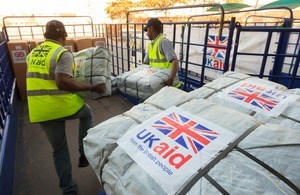 The UK is stepping up humanitarian support including food packages and medical supplies. The UK is stepping up humanitarian support including food packages and medical supplies to help Malawi’s most vulnerable families survive one of the country’s worst food shortage crises in over a decade. As one of the leading humanitarian donors to Malawi, the UK has been at the forefront of the response to Malawi’s international appeal for emergency aid following widespread droughts and flooding due to El Nino weather effects. Today’s announcement brings the UK’s humanitarian support in Malawi since October 2015 to £14.5m. A Save the Children-led consortium can provide small cash transfers to over 450,000 people to buy basic food supplies for their families at food markets, helping stimulate local maize and other food markets. Vital protection support to vulnerable people, including women and girls, in displacement and refugee camps through the United Nations High Commissioner for Refugees. Support to improve livelihoods for some of the most vulnerable households, including vaccinations for over 150,000 livestock through the UN’s Food and Agriculture Organization. Scotland can be proud of our long standing links with Malawi and we can be proud of the outstanding work civil servants from DFID’s dual headquarters in East Kilbride are leading on worldwide. My visit to Malawi this week has reaffirmed how much people here value the great bond which exists between our two nations. This new UK funding will help strengthen this bond and provide life-saving support to hundreds of thousands of Malawians. Due to the El Nino weather phenomenon affecting much of Africa, widespread drought is causing millions of people to go without food, while thousands more have lost their homes and livelihoods in severe floods. The UK has been at the forefront of preventing and preparing for the effects of El Niño in the world’s poorest places, including in Malawi. Providing support is hugely important to African people and is also in the UK’s national interest. The UK Government, through the Department for International Development (DFID), has a programme of ongoing support worth over £80m in Malawi this year in health, education, agriculture, water and sanitation, economic development, increasing access to justice for women and vulnerable groups, accountability and governance reforms. El Niño is a natural climate phenomenon that happens roughly every four years, linked to abnormally high ocean temperatures in the central and eastern Pacific. It increases the risk of extreme weather from droughts to floods to cyclones. You can read more about the work DFID are leading on to help those suffering as a result of El Niño.